City of Johannesburg: Johannesburg remains under ‘partial water restrictions’ and Johannesburg Metro Police Department will continue enforcing by-law compliance. Please report non-compliance to 011 758 9650. No watering of gardens between 06:00 and 18:00 during the period 1 September – 31 March. No watering of gardens between 08:00 and 16:00 during the period 1 April – 31 August. Restriction tariffs will no longer apply as of 1 April 2017. You may fill up your pool but it is recommended you use a pool cover to reduce evaporation. You are prohibited from hosing down pavements and driveways with municipal water. Residents shouldnot irrigate gardens with a hosepipe or sprinkler between 06:00 and 18:00. People are only allowed to do so between 18:00 and 22:00. Report water leaks or burst pipes at 012 358 9999 or waterleaks@tshwane.gov.za. City of Ekurhuleni: Level 2 water restrictions are still in place until such time as a press statement is released stating otherwise. What to do if you get a visit by a Green Scorpion? There are approximately 1300 Green Scorpions in the country. Among their ranks are pollution, waste management, building inspectors, animal and plant experts – but they are not all invasive species experts. Ask to take a picture of their credentials with your cell phone. Or write down their names and designations. You have a right to know who they are … there have been cases of robbers impersonating Green Scorpion officials to gain access to a property. If a SANA Member doubts the identification credentials of a Green Scorpion, phone or What’s App the credential details to the SANA office, a SANA Executive Council Member or Kay Montgomery (082 659 0939) immediately. Calls will be made to high level DEA officials to check the authenticity of the Green Scorpion inspection on your property. If you believe that there is a danger, take the details of the EMI Green Scorpions wishing to do an inspection of the property. Indicate that you are alone and offer to open up your property at a date to be negotiated in the future. Garden centres cannot bar an EMI from entering the premises. Once EMIs are on the property. Show them around. Be courteous. Be professional. Most EMIs are university graduates with an environmental degree. Do not patronise them or become passive aggressive. Take note of the date,together with the time they arrive and the time they leave the premises. Take a picture of all documentationthat they produce (or a Photostat) and What’s App or email the documentation to SANA. Take a picture of any plantsthat they have deemed to have found to be invasive and What’s App or email the images to SANA. SANA will then contact the relevant authorities to gain clarity on the possible transgressions and advise their members on what to do next. In terms of Agricultural Pests Act, 1983 (Act No. 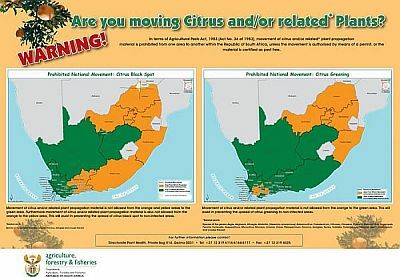 36 of 1983), movement of citrus and/or related plant propagation material is prohibited from one area to another within the Republic of South Africa, unless the movement is authorised by means of a permit, or the material is certified as pest free. Please refer to the map below for more detail. 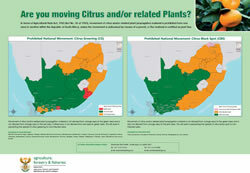 For more information click here to link to the Department of Agriculture, Forestry and Fisheries website. Download the revised water act 36 of 1998. Download the list of the latest Acacia species name changes. SAPIA News No. 30 puts the spotlight on invasive cacti and fountain grass in the Karoo; provides an update of the NEMBA regulations; and gives a summary of contents of 30 editions of SAPIA News. Download here. Please call for requests to have new kinds of plants declared in terms of the Plant Breeders’ Rights Act, 1976 and relevant documentation, below. All breeders of new plant varieties or their agents are invited to submit their requests; such requests should specify the scientific name (genus and species) of the plant to be declared as well as the motivation for the declaration thereof. The NWRS – 2 has been published by the Department of Water Affairs and presents a summary of the second edition of the National Water Resources Strategy (NWRS-2), as required under the National Water Act (Act 36 of 1998). The first edition of the (NWRS-1) was published in 2004 and set out the ‘blueprint’ for water resources management in the country for the first time. This NWRS-2 sets out the strategic direction for water resources management in the country over the next 20 years, with a particular focus on priorities and objectives for the period 2013 – 2017. It provides the framework for the protection, use, development, conservation, management and control of water resources for South Africa, as well as the framework within which water must be managed at catchment level, in defined water management areas. It is binding on all authorities and institutions exercising powers or performing duties under the National Water Act (Act 36 of 1998). BUSA would like to develop our position and provide feedback to the Department by 30 September.